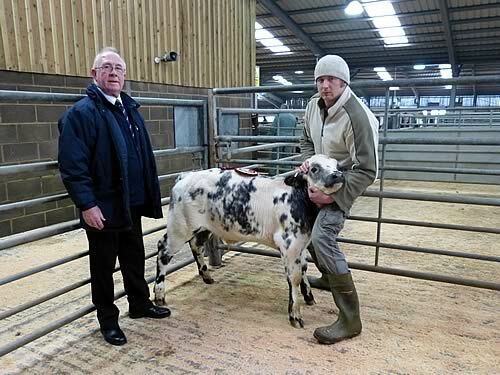 Alan Middleton, of JP and KE Hartley, Beamsley, Bolton Abbey, emerged as the champion with his first prize British Blue-cross bull calf, beating last year’s winners, the Sowrays, into second place, which sold for £540. The champion was out of a second calver Holstein, sired by Genus Fertility Plus, and sold for the top price of £570. JP & KE Hartley also claimed second and third place in the Native-cross bull class, selling for £308 and £238, while the class was won by JT & E Thomber, of Clitheroe, who sold for £258. Reserve champion, a British Blue-cross heifer, was put forward by Sutton-in-Craven’s Richard Spence, of F Spence, another consistent frontrunner in the Skipton calf ring, beating Church Farm Enterprises, who took second in this class, and C & SB Whitelock who were third. The reserve champion was sold for £380. F Spence also took first prize in the Black & White bull class, selling for a price of £250 with JT & E Thornber picking up second, selling for £220 and FA Holmes & Son third, selling for £190. Thornber and Holmes also finished second and third in the Native-cross heifer class, which was won by J Rushton. Father and son Fred and Mark Houseman, who trade as Church Farm Enterprises at Burton Top Farm, near Burton Leonard, won first and third prize in the Continental-cross male stirk class, picking up £435 and £415, with JC Marshall coming in second and selling for £515. Church Farm went on to win first and second prize with their Continental-cross heifer stirks, which sold for £340 and £320 with GT Booth coming third and bringing in a price of £370. The quality on offer was befitting of any show and a large ringside of buyers bid freely to secure what they could. The show was judged by Sam Beachell, of Driffield, and sponsored by Cogent.